This condo in a renovated school house in Davis Square is spectacular! The former Lowe School at 185 Morrison Ave in Somerville MA is a block from Davis Square and set above the street. Unit 101 is a high first floor corner unit. Light streams in through the oversized windows. If you like high ceilings you’ll love 185 Morrison. I don’t know how high these ceilings are – very high is all I can say! There’s a wall of built-in bookcases in the expansive dining / living room and a library ladder to help you reach the top shelves. The original chalk wells remain as a reminder of the building’s origins. The list of improvements is long and includes a sleekly styled kitchen renovation with Liebherr and Jenn-Air appliances and Caesarstone counters, a remodeled bathroom with Duravit sink and rain shower head, custom lighting throughout, oodles of custom fitted closets, replacement windows and more. There’s a parking space behind the building, a spot to stow your bike downstairs, extra storage and common laundry. 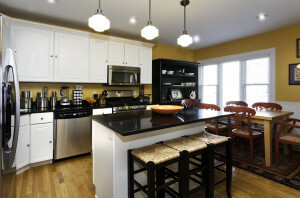 The photographer came this morning so check back for some beautiful shots of 185 Morrison Ave in Somerville. The condo comes on the market tomorrow and can be seen by appointment or at the open houses on Friday, April 19th from 5 – 7 pm and Saturday and Sunday, April 20th & 21 from 1 to 2:30 pm. If you’d like more info or want to set up an appointment please call Liz Bolton of ReMax Destiny- that’s me! – at 617-504-1737. 80 Webster Ave in Somerville MA is a 46-unit condo building built in 2009 by noted local developer David Aposhian. 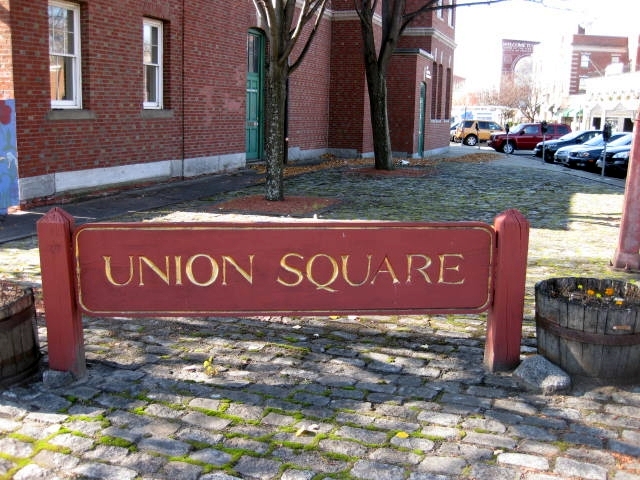 Midway between Inman Square in Cambridge and Union Square in Somerville, 80 Webster Avenue is one of three associations that make up the Union Place complex. There are studios, one, two and three-bedroom condos at 80 Webster Avenue. Somerville condo buyers looking for an elevator building with garage parking will want to check out any available condos here. Residents enjoy the close proximity to a myriad of restaurants and cafes in Inman and Union Squares. If all goes as planned, soon the Green Line T will be nearby. Studio condos – approx. 450 – 575 sq. ft.
One-bedroom condos – approx. 650 – 800 sq. ft.
Two-bedroom condos – approx. 900 – 1100 sq. ft.
Three-bedroom condos – approx. 1450 sq. ft. If condos are available at 80 Webster Ave Somerville MA 02143 they will appear below. Click on the small photo for additonal info and more photographs. And if you’d like to schedule an appointment or get more info about Union Place or Somerville condos, please give me a call. Liz Bolton, ReMax Destiny, 617-504-1737. 80 Webster Ave Somerville MA 02143 is part of the Union Place complex.